I’ve been following tweets about orchids and it seems that there are a few very common questions from first time orchid owners. So I’d like to take a moment to address the top three FAQs for all orchid newbies out there. 1. My flowers are shriveling and falling off. Is my orchid dying? And now for the good news: the other sad Phal (the one on the left on the photo, in the green bowl) seems to be making a comeback! 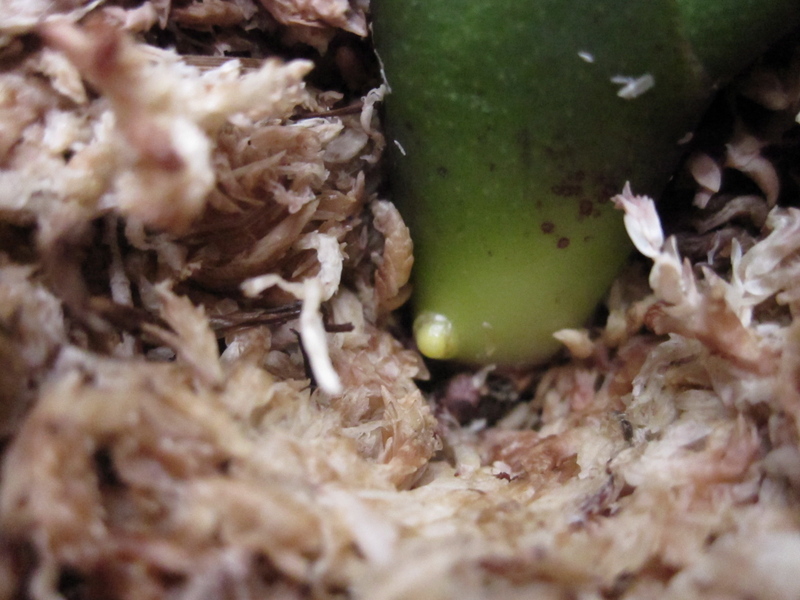 Last time I wrote, there was just the teeniest root nubbin starting to poke out of the base of the plant. Since then, that root has grown and another two have started to come in. Even better, which I just noticed a moment ago, the plant is beginning to grow a new leaf out of the top of the crown—a definite sign that it’s recovering after all! A second piece of good news is that my biggest Phal is about to bloom! There are eight buds so far and one of them is just beginning to open up today. I’m super excited about this one – its blooms are GORGEOUS. You better believe I’ll post photos when its blooms open up!! 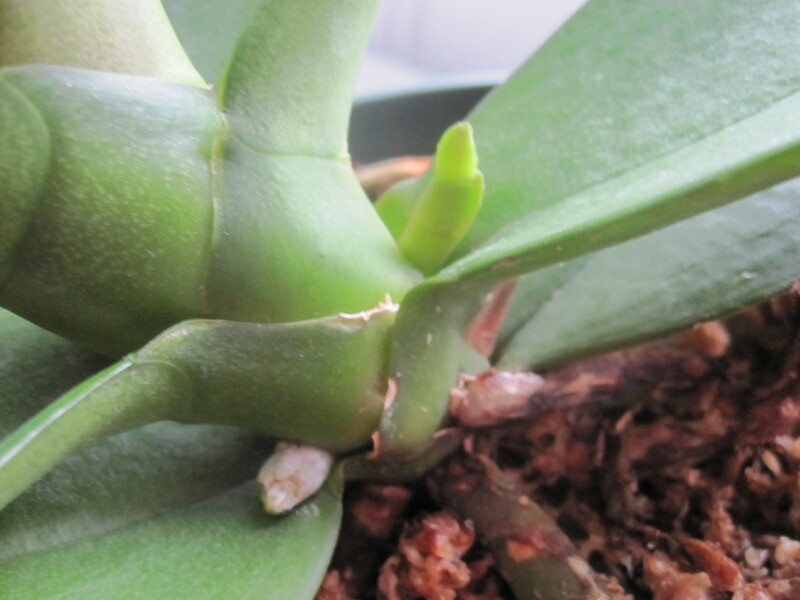 Something is poking out of the base of your orchid plant. 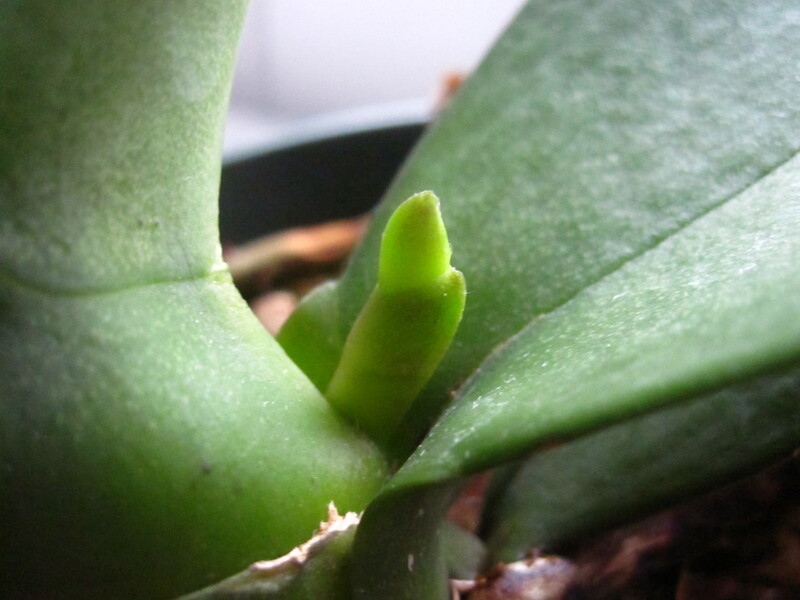 Is it a new root, or—even more exciting—a flower spike? It can be hard to tell the difference, especially for orchid beginners. 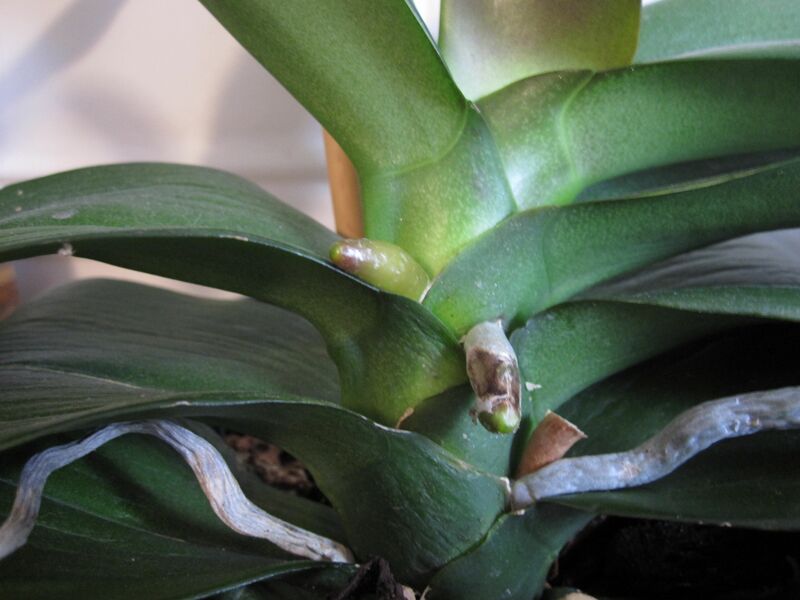 In a Phalaenopsis orchid, both roots and spikes are usually green when they begin to emerge, which makes it that much harder to distinguish the two. I’ve found that with orchids, the easiest way to learn is with our eyes. So, I write bearing visual aids. The long silvery thing in this first photo is a healthy, dry root. And the small green nub you see to the right of the long silvery root is a new root beginning to poke out from the plant stem. New Phalaenopsis roots usually appear with a green tip, and as they grow longer they will become silvery near the base of the plant. If you click the photo to view the larger version, you will see there are actually two new roots coming in – the green one on the right that I already mentioned, and a second one just above the longer silver root. 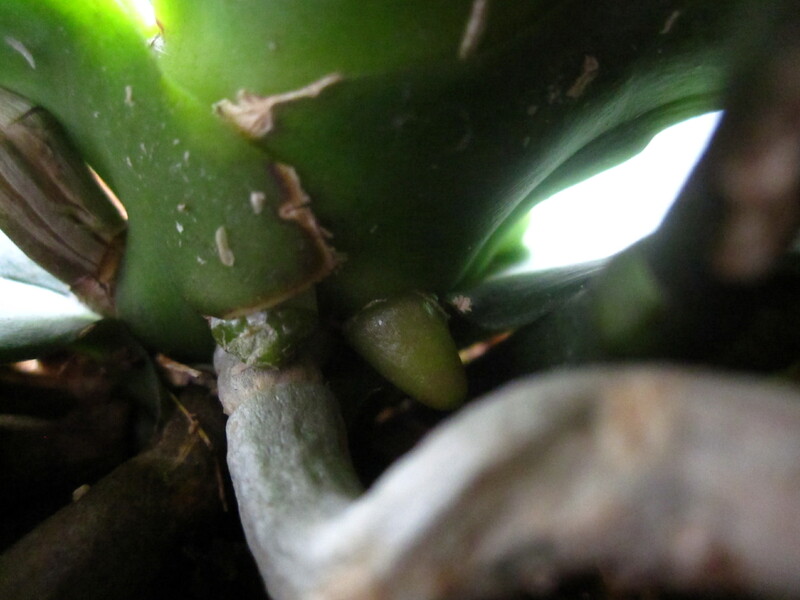 This next photo shows a brand new flower spike growing out of the base of another one of my Phalaenopsis orchids. It’s a slightly brighter green and a tad flattened, with what looks almost like a tiny mitten at the tip. It’s this mitten shape that, for me, is what most easily distinguishes a root from a spike. In the third photo you can see both a new root (silver, on the left) and a new spike (green mitten, on the right). Cool, huh? I’m always excited to see ANY new growth on my orchids – whether it be a new root, spike, or leaf – because new growth is a sign of a happy and healthy plant. Of course I’m keeping my fingers crossed for more spikes, because that means MORE FLOWERS! but I’ll take new roots too. Growing orchids at home sure is a good way to strengthen your patience muscle. Updated to add: I receive many questions from readers about orchids that have leaves and roots growing off of the spike. These are called keikis (baby orchids), and they can be viable plants on their own once their roots grow long enough. I have written a separate post about keikis and what to do with them. Read all about keikis here. P.S. For another great source of information about how to successfully grow orchids, I recommend signing up for a [Affiliate Link] free Orchids Made Easy newsletter from Ryan “The Orchid Guy.” He brings tons of tips and advice straight to your inbox, every day! Last week I made a few changes to the orchid setup in my apartment. I did some reading up on Phalaenopsis orchids and determined that mine might be getting too much light in my very bright southern-facing windows. A couple of them have a red tinge around the edge of the leaves, which is a sign of too much light. 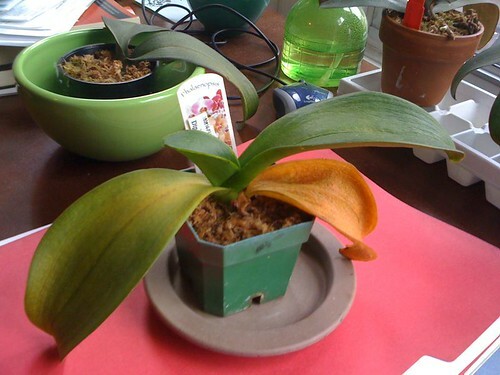 And as I recently posted, a couple of my Phals are in pretty bad shape.